They've got a nasty typographical error on their web site and posters. 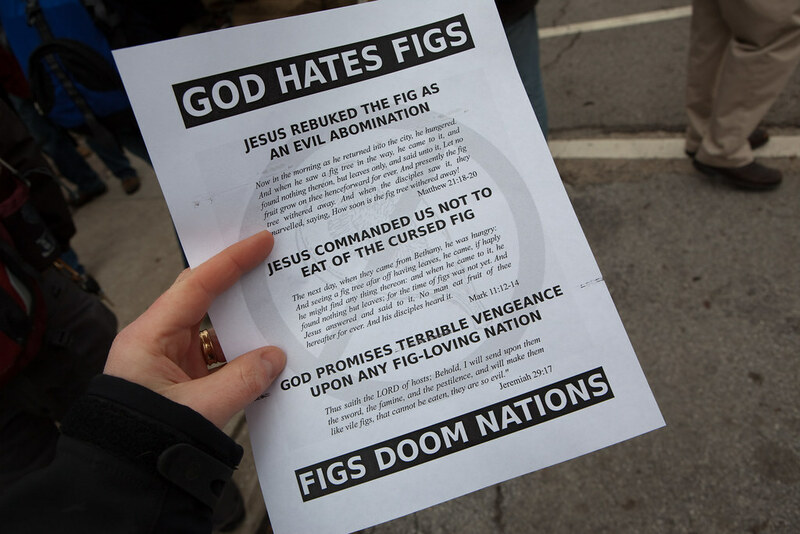 The truth is, God hates figs. Very witty and an excellent riposte. 2. At least make some sense in your venom. Perhaps I'm being overly optimistic, but maybe there's actually a brilliant cynic working in the church office there? Dragon I assume you know little of the Westboro Baptists. They are a very small ultra hyper super apocalyptic fundamentalist church. They only have 40 or so members most of whom are part of the extended family of the control freak pastor, and are infamous for picketing military funerals with their fluorescent placards proclaiming among other things that "God hates fags" and telling anyone who will listen that the dead soldier is going straight to Hell. These charmers recently paid a visit to the University of Chicago where students rather than get upset by them, parodied their message with among other things this flyer. It was produced by the students as a joke, not by the Westboro Baptists. This short film tells the story, and this flickr set is where the pics came from. Ahhh...well, I was pretty close then! Cheers for the relevancy links.